In a suite at Big Daddy’s mansion on his estate, Brick showers and dries off as Margaret complains first about Gooper and Mae, and then about Brick’s behavior, which has involved quitting work, drinking, and breaking his ankle while attempting to jump hurdles on a high school track field. Margaret says Brick looks just as fit as he did before he started drinking though, and reminisces about what a wonderful lover Brick used to be. Margaret tries to get Brick to sign a card for Big Daddy’s birthday present, but Brick refuses. The two struggle as Margaret attempts to seize Brick, who pulls away violently and grabs a small chair to shield himself from her. They pause for a few moments before laughing, just as Big Mama calls through the door. Big Mama says she has wonderful news about Big Daddy. She reports that the tests for cancer came back negative, and all he has is a spastic colon. Brick, hiding in the bathroom, doesn’t respond, and Big Mama tells him and Margaret to get dressed before everyone comes upstairs for Big Daddy’s party. Big Mama then asks Margaret, quietly, whether Brick’s been drinking or not, and then asks, more pointedly, whether Margaret makes Brick happy in bed, insinuating that it’s Margaret’s fault Brick has turned to alcohol. Big Mama exits, leaving Margaret indignant and alone. When Brick exits the bathroom, Margaret reveals that Big Daddy and Big Mama were given false reports—Big Daddy is in fact dying of cancer, and Big Mama will be informed after the party. Restless again, Margaret murmurs that she made her mistake when she told Brick about her fling with Skipper. Brick warns her to stop talking about Skipper, threatening her with his crutch, but Margaret continues. She talks about how close Brick and Skipper were, claiming that she and Skipper made love in order to feel closer to Brick. Brick hurls his crutch across the room at her while she hides behind the bed. Margaret informs Brick that she’s been to a gynecologist in Memphis and is in perfect shape to bear children. Brick comments that he doesn’t see how she could have a child with a man who can’t stand her and won’t sleep with her. At this point, the guests arrive in Brick and Margaret’s suite, with Big Daddy in the lead. When Margaret attempts to give Big Daddy his present from Brick, another catty exchange between Margaret, Mae, and Big Mama ensues, and Big Daddy bellows for everyone to be quiet. When Reverend Tooker finishes a sentence in the silence, Big Daddy turns on him, and when Big Mama comes to the reverend’s defense, Big Daddy turns on her instead. She tells him that she’s loved him all these years and rushes out of the room with a sob, as Big Daddy says to himself, “Wouldn’t it be funny if that was true…” Eventually, Big Daddy asks to see Brick, and they’re left alone together. Big Daddy confronts Brick about his drinking, while also talking about how much better he feels after the health report confirming his lack of cancer. Brick claims that he drinks out of disgust for mendacity, but eventually, he reveals the truth that Skipper confessed his love to Brick over a long-distance call, and Brick hung up on him. Brick also reveals that Big Daddy is the only one who doesn’t know the truth of his own health report: that he does have cancer. Big Daddy, astonished, leaves the room, retreating down the hall. The guests reenter, assuming Big Daddy has gone to bed. They gather around Big Mama to deliver the truth about the health report. Big Mama, in hysterics, rejects the trusteeship Gooper drafted in case of Big Daddy’s death and runs to Brick, calling him her “only son.” She tells him it would be Big Daddy’s dream to have a grandson from Brick. Hearing this, Margaret announces that she is going to have Brick’s child, to the delight of Big Mama and the disbelief of Gooper and Mae. Big Mama rushes out to tell Big Daddy, as Mae confronts Margaret about her lie before exiting with Gooper. Cao, Diana. "Cat on a Hot Tin Roof Plot Summary." LitCharts. LitCharts LLC, 26 Nov 2013. Web. 18 Apr 2019. Cao, Diana. "Cat on a Hot Tin Roof Plot Summary." LitCharts LLC, November 26, 2013. 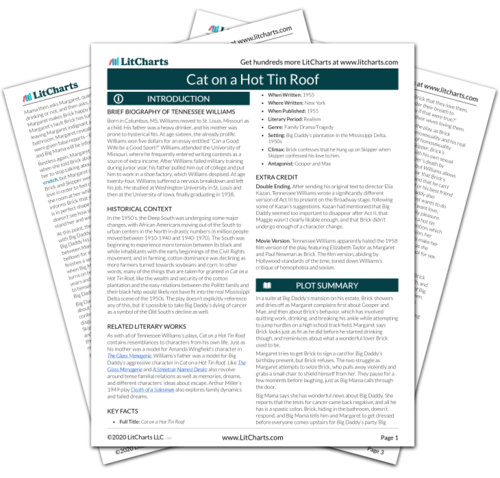 Retrieved April 18, 2019. https://www.litcharts.com/lit/cat-on-a-hot-tin-roof/summary.